[SPOILER] The King Is Dead. Anyone Want To Be King? 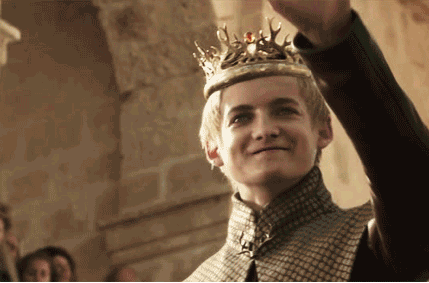 Congrats to Jack Gleeson on helping to animate a character so vividly hated by so many people. Joffrey will be missed by all of us who enjoy a good sadist/coward combo (a classic trope of Western storytelling). I do hope Jack hasn't been getting blowback from unbalanced Game of Thrones fans who can't distinguish between the actor and the role. One of the biggest problems facing us today isn't anti-vaxxers, or climate deniers, or Holocaust deniers, or creationists. It's the force behind them that makes all of it possible - a deliberate rejection of knowledge, a triumphant ignorance. This kind of ignorance can only flourish when we as a society lose our "herd immunity" to nonsense; and we keep that immunity by knowing how to think. By understanding the laws of logic and evidence, of separating truth from lies, of coming to correct judgments. Here's an article that helps a little. I just went through New York's ACA marketplace to change my health insurance. I'm now saving about $70 a month, with expanded coverage. Thank you, Obamacare.